BOSTON — Doctors-in-training are still too exhausted, says a new report by the Institute of Medicine. Five years ago, the IOM capped how long residents can work, 80 hours per week. But as NewsCenter 5’s Ed Harding reported Tuesday, the IOM is calling for hospitals to allow doctors to get more rest. For young doctors fresh out of medical school, on-the-job training can be grueling. “Everyone realizes that resident fatigue is something that we have to deal with,” said Dr. Matthew Eisenberg, a senior resident of pediatrics at Children’s Hospital Boston. “Thirty hours is the longest shift I’ve ever worked,” he said. Five years ago, the Institute of Medicine capped how long residents could work, up to 80 hours per week. “About 75 percent of residents before the 80 hour rule were burnt out. They were not feeling good about their job. About 25 percent were depressed,” said Dr. Ted Sectish, the program director for the Boston Combined Residency Program in Pediatrics. Sectish admits that sleep deprivation can also lead to medical mistakes, putting patients at risk. 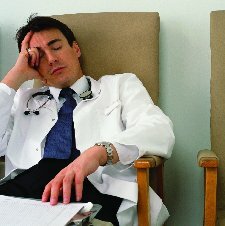 A new report by the IOM found young doctors are still too tired, despite the 80 hour a week limit issued by the IOM. It has recommended easing the workload a bit more, so doctors can get more rest. “In those 30 hour shifts they recommend they only care for new patients for the first 16 hours, and they recommended there be a five-hour period of sleep,” Sectish explained about the IOMs recommendations. – An increase in the number of mandatory days off each month, and extend hours off between shifts depending on how long the resident working, during day or night. “So they’ve asked that the string of nights be no more than five nights. And that when you go from four night shifts to day shifts, you should have 24 hours to catch up on some sleep,” Sectish said. The accreditation council did not immediately say if it would follow the recommendations. However, Sectish said the recommendations are taken very seriously by hospitals.